IoT and Smart Home Technology; Let’s you live smarter. May it be your favourite actor video, the latest development in the country or inquisitiveness about any information, Google has an answer for all. Yes, this search engine has become the ultimate saviour in our lives. Here, you can search anything and you get millions of results to choose from. But, have you ever thought that how this ‘Digital God of searches’ manages to do so much for you? Well, it relies on its algorithm. Algorithms are basically its self-built intricate ways of ranking your website in the crowd of many. Panda 4.2: Rolled down on July 17, 2015, with an aim to push down lower quality content sites. This was technically a refresh and not a new update. The keyword stuffed, ugly, broken, unscrupulous website and old repetitive content have no value to it. It has helped small and medium sized with fresh and meaningful content to rise in their rankings. Penguin 4.0 Phase2: It surfaced on October 6, 2016, with a basic purpose of devaluing bad links. Penguin is entirely based on the concept that quality inbound links from your website to other portal increase the relevance of your content and similarly other websites will only link to your website when you will have appropriate content to provide their audience. With time it was noticed that SEO specialists started relying more on quantity inbound links rather than quality but now with this update, all bad links will potentially get you ban from good ranks in search engine. Possum: Previously, the businesses which were not located within a city and are just outside the city boundaries, used to face a tough time in the results of search engines. But with this update on September 1, 2016, local results are diversified and spam is prevented from ranking well. Mobile-friendly 2: This update was launched on May 12, 2016, keeping in mind the advent of smartphones and other devices. So, here if your website is not mobile or other devices friendly, it will not rank higher in the searched results. Here, Google provides a mobile-friendly test link also; https://www.google.com/#q=mobile+friendly+test. Your website must be run through this tool so that you get to know how well you perform on mobiles and where all you need to improve. AdWords Shake-Up: After trying and testing, on February 23, 2016, Google finally removed the right-hand ad sidebar and specifically put 4 of the ads just above the search results. As a result, only 10 natural organic positions were left on the first page of the search result and there was a huge increase in the CTR, as high as 10%. 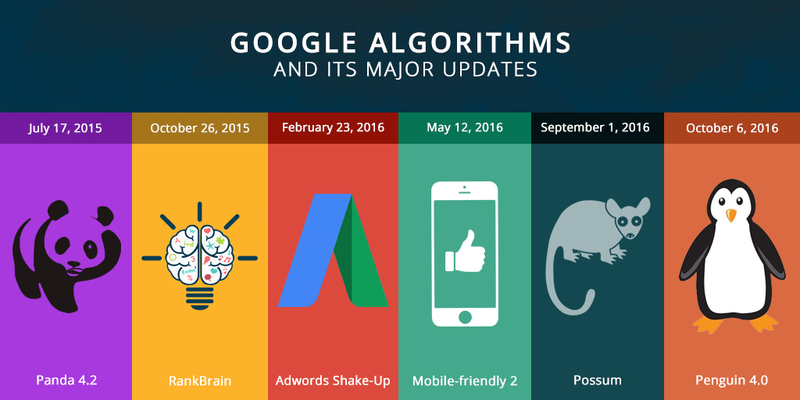 RankBrain: Google confirmed the use of RankBrain on October 26, 2015, where it said that RankBrain is the third most important factor in the ranking algorithm along with content and links. This algorithm makes a guess about a word or phrase which it might not be familiar with and accordingly shows the results. In short, it is a contextual based search which is said to prefer natural (no keyword stuffed) content.